Torrance , CA, October 21st, 2004 - Yamato USA, the North American subsidiary of Yamato Co., Ltd. is enormously proud to announce the arrival of new items from the popular manga / anime and video game titles Cowboy Bebop, Tekki (aka Steel Battalion), and the Misadventures of Tron Bonne, as well as the return of South Park's Cartman, Kyle, Stan, and Kenny in on convenient four-pack. Cool and confident, Faye Valentine is the kind of gal you want to avoid in a shooting match as equally in a card game. As Spike Speigel's bounty hunting rival, she is not afraid to take a risk, especially if it means beating Spike to the punch. Captured here, Miss Valentine sits as cool and confident as ever amidst a card game, featuring a stunning character likeness with delicate, yet profound paint applications. At approximately 5.5" in height, the Faye Valentine PVC statue comes with a bar stool display stand and a playing card all sealed in collector's window box packaging. She's going to steal your heart and your wallet in the same time. Ahhh, Julia... the woman from Spike Speigel's past, the woman around whom so many of his memories revolve. And as if from a dream, Julia appears in this beautiful PVC statue to stir up old memories... and old rivalries. This wistful representation of Julia stands approximately 8.75" tall, comes pre-posed and painted with her own display stand, sealed in collector's window box . Running, shooting and devastating their way into your home is this assortment of collectible miniature figures from Yamato's Capcom Figure Collection. Inspired by the hyper-technical battle-mecha simulation videogame created by Capcom exclusively for the Microsoft Xbox these faithful replications in miniature include Quasar, Vitzh, Jaralaccs C and N, and Decider. 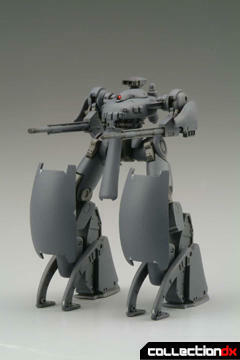 Each figure stands approximately 4" tall, features limited articulation and come sealed on a blister card. Yamato continues its tribute to the leading ladies of Capcom with this third in a series of PVC Statues. 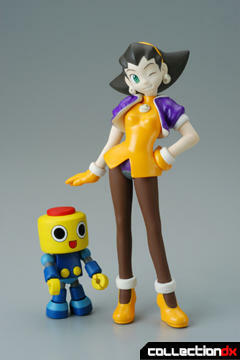 Tron Bonne, better known as MegMan's rival, is the heroine pirate of Capcom's The Misadventures of Tron Bonne. Standing at approximately 6.25", Tron Bonne comes complete with her adorably cute servbot companion, Kobun, who you can nuture, snuggle... or TORTURE! Available in either Player One or Player Two colors, Tron Bonne and Kobun come sealed in blister card style packaging. The foul-mouthed foursome as seen in Comedy Central's long-running and highly successful South Park animated series can now be found in one convenient 4- pack! 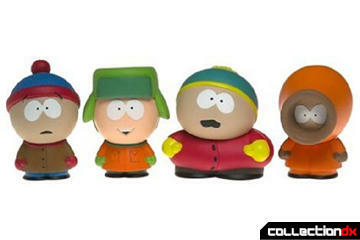 The ultimate gift for any South Park fan, this set includes Cartman, Kyle, Stan, and Kenny. Each figure is approximately 5" in height and come packaged together in a single window box! If you missed either the first or second wave of South Park figures then this is a second chance at a bonafide hit with collectors everywhere! Yamato USA is the wholly owned subsidiary of Yamato Co., Ltd with headquarters in Tokyo , Japan . For over six years, Yamato USA has proudly served the North and South American hobby/collector markets with a wide offering of miniature collectible figures, PVC and die-cast action figures, as well as poly-resin and PVC statues inspired by the hottest titles in Japanese anime, manga, and video game properties. Featured properties include Masamune Shirow's Koukaku-Kidoutai (a.k.a. Ghost in the Shell), Appleseed, and Intron Depot; Yasuhiro Nightow's Trigun, Nobuhiro Watsuki's Rurouni Kenshin (aka Samurai X), Kentaro Miura's Berserk, and Katsuhiro Otomo's Akira.